The cover really says it all. 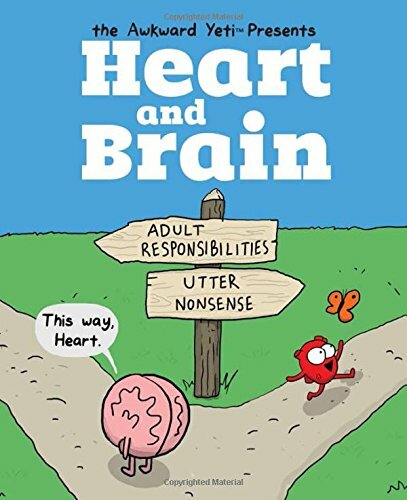 This is a collection of web comic artist Nick Seluk's best Heart vs. Brain comics. I picked up this book because I am a fan of The Awkward Yeti comics. Seluk does an amazing job of depicting real-life battles between what your heart wants and your brain knows is best. Every page of this book made me laugh because it's so easy to identify with the characters. We've all been in situations where our brain tells us "yes, I remember this person's name" only to find out our brain forgot how to talk. And I know I'm guilty of letting my heart talk me into purchases that my brain told me weren't worth it. This is a great book if you're in need of a laugh. So many of the situations and conversation in this book are relatable to everyone. I highly recommend this book and the web comic.